Translucent agate with green to reddish green inclusions. Moss agate is not enhanced. 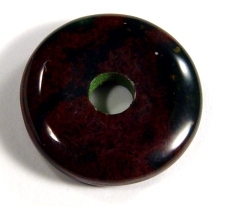 Moss Agate is a member of the Agate gemstone family. Translucent to opaque, colors may vary widely from the picture as every stone is unique.